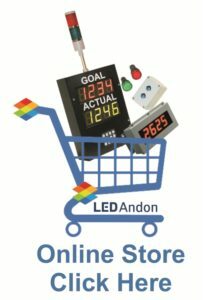 LED Andon Lights, LED Stacklights, LED Tower Lights. The utilization of LED Stacklights or LED Tower Lights is extremely effective when visual signaling is necessary and price is an issue. Anything from one to five colored sections are available as well as with audible signaling and flashing capabilities. These are easy to mount and wire to your switch, PLC or machine output for control. Workstation call light indication at a glance. Tri-color indoor beacon for red/yellow/green indication. When space is an issue yet indicators are essential, the LED Light Signal Beacons are a preferred method of conveying messages. These Beacons are typically provided with multi-color uses such as Red/Yellow/Green activation. LED auto call light is ideal for giving operators visual indication of elapsed time during their cycle or process. Set easy internal step value for auto color change. This Auto Escalation Call Light could also be used for identifying and prioritizing machines needing attention the most. Locate areas that have been down the longest based on color and flash pattern activated. Simple LED stack light requires single output from machine. Anytime machine is down, activate output to light and the light will do the rest. Stacklight andon stations provided pre-wired with power cord. These Switch Stations are easily integrated into most production environments where signaling is needed and ‘Plug and Play’ is desired. Just mount the Stations, plug them in, and enjoy the signaling capabilities. Signal indicator lights are a low cost means of alerting personnel of vital plant data and status at a glance. LED Indicators are great tools for OEMs looking for a low cost alternative from incandescent that require routine maintenance. LED signal lamps provide long life and far distance viewing. Stack-lights, tower lights and signal beacons are an economical and effective tool for any facility. Commonly used for material, line stoppage indication, quality, supervisor, line leader or team leader requests, plc output control, predictive and preventative maintenance, as well as reactive maintenance.